This paper examines the relation between friction/wear and different types of steel materials under different normal loads and sliding velocities and to explore the possibility of adding controlled normal load and sliding velocity to a mechanical process. In order to do so, a pin on disc apparatus is designed and fabricated. Experiments are carried out when different types of disc materials such as stainless steel 304 (SS 304), stainless steel 316 (SS 316) and mild steel slide against stainless steel 304 (SS 304) pin. Variations of friction coefficient with the duration of rubbing at different normal loads and sliding velocities are investigated. Results show that friction coefficient varies with duration of rubbing, normal load and sliding velocity. In general, friction coefficient increases for a certain duration of rubbing and after that it remains constant for the rest of the experimental time. The obtained results reveal that friction coefficient decreases with the increase in normal load for all the tested materials. It is also found that friction coefficient increases with the increase in sliding velocity for all the materials investigated. Moreover, wear rate increases with the increase in normal load and sliding velocity. At identical operating condition, the magnitudes of friction coefficient and wear rate are different for different materials depending on sliding velocity and normal load. Study of mechanics of friction and the relationship between friction and wear dates back to the sixteenth century, almost immediately after the invention of Newton’s law of motion. It was observed by several authors (Archard, 1980; Aronov et al., 1983, 1984a, 1984b, 1984c; Berger et al., 1997; Bhushan, 1999a; Lin & Bryant, 1996; Ludema, 1996; Oktay & Suh, 1992; Saka et al., 1984; Suh & Sin, 1980; Tabor, 1987) that the variation of friction depends on interfacial conditions such as normal load, geometry, relative surface motion, sliding velocity, surface roughness of the rubbing surfaces, type of material, system rigidity, temperature, stick-slip, relative humidity, lubrication and vibration. Among these factors normal load and sliding velocity are the two major factors that play significant role for the variation of friction. In the case of materials with surface films which are either deliberately applied or produced by reaction with environment, the coefficient of friction may not remain constant as a function of load. In many metal pairs, in the high load regime, the coefficient of friction decreases with load. Bhushan (1996) and Blau (1992) reported that increased surface roughening and a large quantity of wear debris are believed to be responsible for decrease in friction at higher loads. It was observed that the coefficient of friction may be very low for very smooth surfaces and/or at loads down to micro-to nanonewton range (Bhushan, 1999b; Bhushan & Kulkarni, 1996). The third law of friction, which states that friction is independent of velocity, is not generally valid. Friction may increase or decrease as a result of increased sliding velocity for different materials combinations. An increase in the temperature generally results in metal softening in the case of low melting point metals. Bhushan (1999a) reported that an increase in temperature may result in solid-state phase transformation which may either improve or degrade mechanical properties. The most drastic effect occurs if a metal approaches its melting point and its strength drops rapidly, and thermal diffusion and creep phenomena become more important. The resulting increased adhesion at contacts and ductility lead to an increase in friction. The increase in friction coefficient with sliding velocity due to more adhesion of counterface material (pin) on disc. It was reported (Chowdhury & Helali, 2008a; Chowdhury et al., 2009a, 2090b, 2011) that friction coefficient of metals and alloys showed different behavior under different operating conditions. Friction coefficient of different material pairs under different normal loads and sliding velocities were investigated by Chowdhury et al. (2012). Nuruzzaman and Chowdhury (2012) reported the effect of normal load and sliding velocity on friction coefficient of aluminum sliding against different pin materials. In spite of these investigations, the effects of normal load and sliding velocity on friction coefficient of different types steel materials, especially, SS 304, SS 316 and mild steel sliding against SS 304 are yet to be clearly understood. Therefore, in this study, an attempt is made to investigate the effect of normal load and sliding velocity on the friction coefficient of these materials. 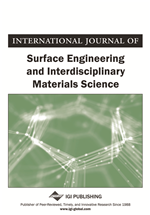 The effects of duration of rubbing on friction coefficient are observed in this study. The effects of normal load and sliding velocity on wear rate of SS 304, SS 316 and mild steel are also examined. It is expected that the applications of these results will contribute to the different concerned mechanical processes.